Learn the pros and cons of medium-density fiberboard, or MDF, and decide whether it's the right choice for your next carpentry project. 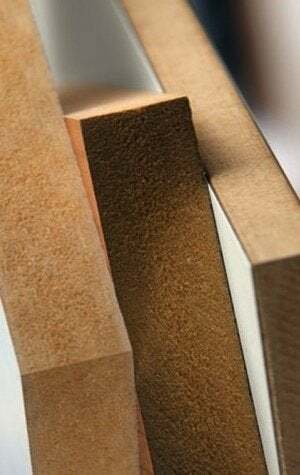 Medium-density fiberboard—most often known by its initials, MDF—rivals the affordability and versatility of plywood and similar engineered wood products. In certain situations, MDF even trumps all the others, because it’s so wonderfully easy to work with. Unlike real wood, MDF has no knots, grain, or warping, and its smooth surface gives way easily to the saw, leaving no splinters, burns, or tear-outs. For light carpentry projects, such as shelving and trim, MDF can be excellent. MDF starts as sawdust and shavings—all the little bits and pieces of wood that are created as a byproduct of industrial milling. Once dehydrated, those wood fibers are then mixed with resin and wax and formed into panels. Under high heat and intense pressure, those panels are compressed and become rigid, with a hard shell. In the final stage of manufacturing, giant machines sand the panels down, giving them a silky smooth finish before cutting them to fixed dimensions. MDF boards are typically tan or a darker brown and are sold primarily in either 1/2-inch-thick or 3/4-inch-thick sheets. Depending on where you live, the largest- and thickest-available sheets should cost you no more than $50. Also, important to note is that an MDF board may be marked or stamped to indicate a particular property. For instance, blue or red marking means that a board is fire retardant; a green marking indicates that it’s resistant to moisture. Working with MDF is the same as working with real wood. You don’t need any new skills or special tools. In fact, you are likely to find that, compared with sawing and attempting detail work with solid lumber, MDF is much more pliant. For smaller projects, such as bookcases or cabinetry, it’s user- and budget-friendly. Plus, its surface accepts paint well and also provides a welcoming base for a thin veneer layer. Handle with care: Heavier than plywood, MDF—particularly full-size MDF panels—can be difficult to carry without an extra pair of hands. 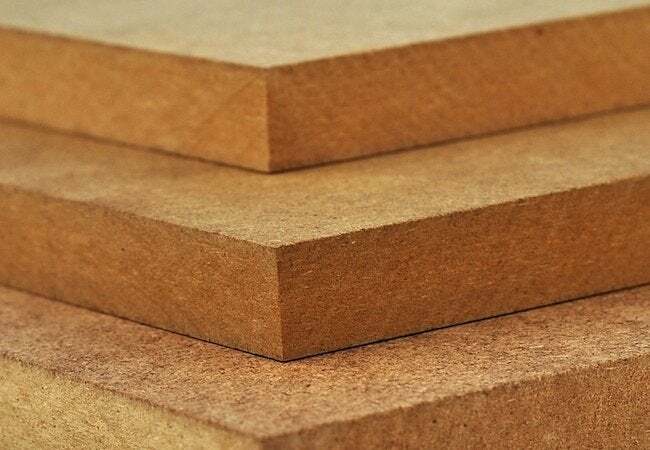 Take care when transporting MDF, because much more so than plywood or real wood, its corners are easily damaged, and its smooth surfaces are easily scratched. Water wary: In its untreated state, fiberboard fairs poorly, swelling or even fracturing when exposed to even a negligible amount of water. That shortcoming would severely limit the number of applications MDF could be used for, if it weren’t for the advent of moisture-resistant MDF, now readily available. Dust settles: Working with MDF tends to create a great deal of dust, and not just run-of-the-mill dust, but a powdery, pervasive species that makes a mess and chokes the air. Go out of your way to seal off your work area, cover any immovable items you wish to protect, and be prepared to vacuum afterward. Health risks: Most MDF contains urea-formaldehyde, a suspected carcinogen. Until it’s fully sealed, MDF continues to off-gas. So when you’re working with this stuff, it’s best to do so outdoors or in a well-ventilated part of the home. You may also wish to go a step further and wear a respirator. Assuming you take precautions to safeguard your personal health, MDF offers several practical and financial benefits. Keeping your eyes open to the pros and cons, give due consideration to MDF.